The effects of war last much longer than the war itself. 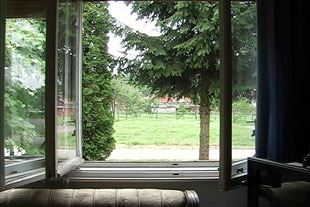 Affected by her husband's war experience, Rachel Ćosić visited Zlatko's childhood home in Bosnia and looked through a window where he was standing and waiting for something to change. "Zlatko was hiding in this house. The window was his view filled with hopes. The war changed those views. Others waited for a moment to catch him. Fear was always present. While escaping, he looked back one last time."